It's the new and improved Cardale Jones, lover of math! Now, any number of things could be going on here. Cardale may very well have reformed his ways and learned to embrace the value of his college degree, or he might just be trolling everyone. Even worse, this could be a parody account, which would just make us very sad for whoever is behind it. 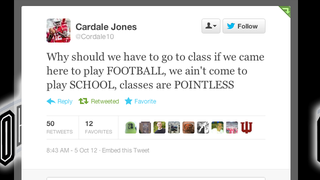 Our hope is that Cardale is trolling, because his original sentiment was spot on. He's not there to play school.